When considering how to decorate a home or office interior, think of how the finished look will accent the room. Quite often, architects specify the use of travertine as a secondary accent, especially for walls covered in natural stone tiles. Mosaics constructed using travertine, glass, and ceramic are expertly manufactured and are an exciting addition to a bathroom, kitchen backsplash, or even a stone floor. Travertine is prized because of its authentic, rustic appearance. This product has been used in the construction industry since the days of the Roman Empire. Today, travertine is exported throughout the world, and mosaic designs are especially popular with homeowners and business property developers here in South Florida. Stonexchange is a locally operated importer of fine quality natural stone. We carry a large inventory of travertine mosaic pieces, mostly in the form of tiles. These beautiful tiles are expensive unless the purchase is for a large quantity. Merchants such as home improvement stores and floor covering outlet retailers benefit from keeping a full inventory of mosaic patterns in stock because the per-piece price is much more affordable. Travertine is a type of limestone. The stalactites and stalagmites seen in caves are often composed of this material. Water percolates through a sedimentary layer, and the contaminants present in the water are what give the stone its visual characteristics. The stone hardens over time, producing a rock that is brittle in appearance but actually quite firm. Sheets of travertine are cut from quarries using large cable saws or water jet equipment. The sheets are graded according to texture, color, and patterning. These sheets can be cut into tiles, pencils, or small rocks which are then tumbled and filled. The small pieces are often assembled on a backing sheet along with glass or ceramic to form beautiful, elegant tiles. Travertine is porous unless filled and honed. The highest priced travertine tiles are treated with a sealant compound during the filling process. Other pieces of travertine are simply tumbled or brushed, with the holes and rough edges remaining. These rustic-appearing pieces are perfect for use in constructing mosaics. Travertine mosaic tiles come in a variety of colors, but the most popular shades are ivory medium and dark noche. The lighter ivory shade is best for use as a mosaic tile because the color shade complements the darker glass or ceramic pieces. These tiles are carefully packed into shipping crates and delivered to Stonexchange, ready for delivery to commercial clients. Because the construction of mosaic tiles involves both machine operation and handcrafting, these tiles are rather expensive unless ordered in bulk. Stonexchange imports the finest quality mosaic tiles in a constant basis, and we enjoy lower than average wholesale costs because we partner with the actual manufacturing operation. Commercial customers benefit from this import and distribution service as well. So long a minimum piece count is ordered, Stonexchange guarantees the lowest wholesale price on these magnificent mosaic tiles. Our company ships directly to customers in Miami and all of South Florida, and because we deliver from our local warehouse, clients can expect quick processing and shipment. Flooring companies and home improvement centers usually have a travertine tile display somewhere on the premises. Customers wanting to decorate a bathroom or kitchen with travertine will often ask about the insets or mosaics available. Having a good supply of samples on hand is important when it comes to retaining customers. Contractors are often asked by their clients about sample pieces. It certainly does help to have several different color patterns or tile blocks handy to show homeowners. This is how merchants can benefit from keeping a good variety of mosaics in their showrooms, along with a full crate of similar styles in inventory. Contractors will need to find a full crate of similar mosaics if they are in charge of a major installment job. Buying the stock a little at a time is not cost-efficient. Knowing that the merchant with whom they prefer to do business can order a full pallet of mosaics on a moment’s notice is very good for business relations. Stonexchange can process an order of travertine mosaic tiles and get it on its way to the customer in as little as one or two days. We carry an exceptional variety of tile patterns and maintain a huge inventory at our Miami distribution center. These mosaics are a perfect complement to our floor tiles, window sills, and thresholds, all of which are available in travertine. Merchants benefit from doing business with a direct importer because they can keep a full inventory at all times of the year or can order product whenever necessary. Homeowners often make last-minute changes to the way they want their kitchen or bathroom to look. This can cause a big headache for installers if their customer requests the inclusion of mosaic tiles after the initial order of product has been placed. It helps to know that a good supply of mosaic tiles made from travertine are available at a local merchant or can be ordered at a moment’s notice. Some companies charge extra for custom orders involving matched product or non-standard sizes. At Stonexchange, our commitment to customer satisfaction includes the opportunity for clients to order custom-size tiles, mix different shades into a single order, or combine an order of tiles, mosaics, sills, and countertop material. Our company does not charge extra for custom orders. If the mosaic patterns required are not currently in inventory, we will have them manufactured overseas at our fabrication facility. This operation may take from two to three months, but there is no extra charge for this service. The details of color, texture, and tile size must be clearly stated by the client. However, Stonexchange has a customer service staff dedicated to filling an order with exacting specifications regarding the appearance of these complex mosaic tiles. An immediate price quote can be generated as soon as the customer completes the order details. This estimate will include not only the per-piece price on a bulk shipment, but will also provide the customer with details on the estimated delivery time. Remember, Stonexchange serves not only the Miami area but all of South Florida. We provide product to dealers throughout the region, and although we do not sell directly to individual consumers, we will be happy to inform them on where they can purchase small amounts of product from one of the merchants to which we supply tiles and mosaics. Stonexchange is committed to offering the lowest wholesale prices on travertine products. Because we do not involve third parties in our import and distribution procedures, we save a tremendous amount of money on high-quality natural stone products. The travertine tiles and mosaics we carry are of the very highest quality, and our advanced quality assurance teams make certain that the most fragile of mosaic tiles are packed securely to reduce damage or product breakage. Whether you are a merchant looking to save money on the finest travertine mosaics on the market or a contractor wanting to know where to obtain travertine mosaic tiles in bulk, Stonexchange is the name to remember. Contact us and learn all the facts about how the direct import business can positively affect your company’s bottom line. 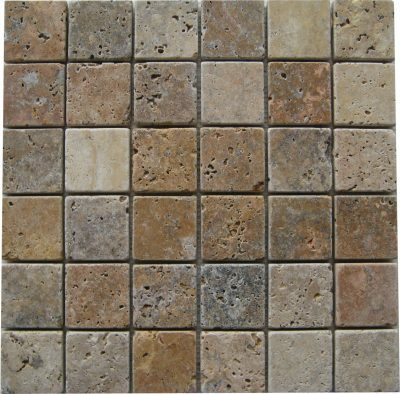 Our company is the best source for wholesale travertine mosaic tiles in all of South Florida.